In the last CLT entry, I wrote about the five reasons why Chesapeake Bay stripers attack a lure: hunger, reaction, competition, territory protection, and curiosity. When fish are hungry, they’re easy to catch. Almost any lure or technique will work on hunger-feeding fish. Unfortunately, most of us don’t have the time or resources to constantly run around looking for schools of voracious fish. If you’re like me, you have to fish in the limited time you have available, and you probably stay close to home. While we may occasionally happen upon groups of ravenous fish, most of the stripers we encounter are hard to catch. 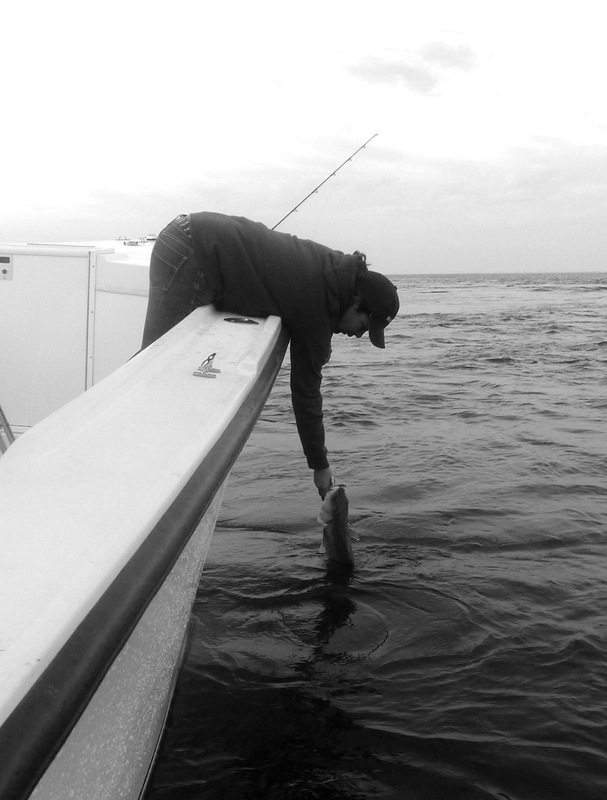 In order to be consistently successful, we have to provoke strikes from fish that may not be particularly inclined to bite. Strike producing lures are especially important right now since we have trophy rockfish migrating in and out of the Bay. 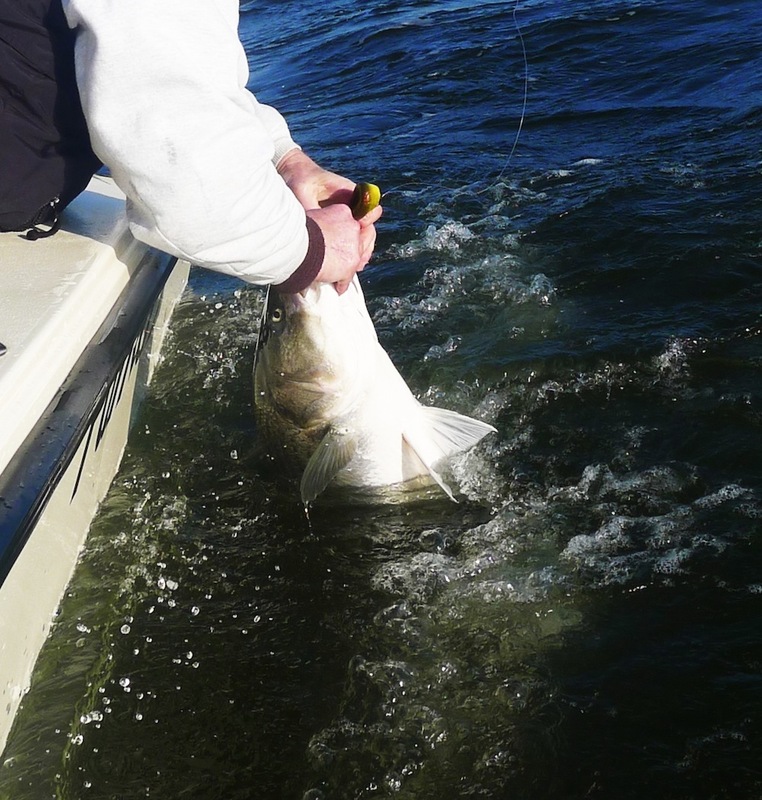 Our chances for catching-and-releasing a 50-pounder on light tackle are better than at any other time of year, but migrating fish have other things on their minds besides eating. Big fish get bigger by being smart and getting smarter. To catch them, we need to cast lures that will provoke strikes by appealing to their five senses; sight, sound, smell, feel and taste. I call the formula 5 by 5. By that, I mean we can consider the five reasons why fish strike, then use lures designed to appeal to each of their five senses in order to come up with the best of all possible strike triggers. In this installment we’ll look at striped bass eyesight. Stripers have relatively well developed brains making them capable of reasonably high cognitive function. They have the capacity for good eyesight and the ability to remember what they see. While their eyesight isn’t as good as many species like trout, or tuna, it is better than bottom dwelling species like drum and catfish. There is recent research conducted by the Virginia Institute of Marine Science (VIMS) that compares the visual capabilities of native Chesapeake Bay species. Since the techniques they use in this fishing science intersect with my chosen profession of human electroneurophysiology, I find it fascinating. VIMS scientists state the obvious when they note that vision is important to the feeding habits of Chesapeake Bay fish. Changing conditions in any estuary can make seeing underwater difficult, but it’s especially tough in the Bay because of the constant mixing of sentiment-filled fresh water with clearer salt water from the Atlantic ocean. The VIMS scientists dubbed our estuarine waters some of the most dynamic photohabitat on earth. “Dynamic photohabitat.” I like that! Some of the factors they list as influential to variability in Bay water color and clarity include vertical mixing, stratification, wave activity, clouds and weather, sunrise and sunset, seasonal solar irradiance, and phytoplankton dynamics. Pollution and excessive sediment runoff also play significant roles in clouding Bay water. 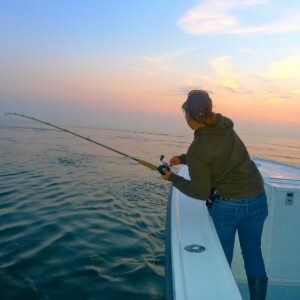 Fishermen know how important water quality is to our fishing, and we also know that water clarity at a given Chesapeake Bay location can change drastically from one day to the next. I’ve watched water at the Bay Bridge go from clear to murky in a matter of minutes. 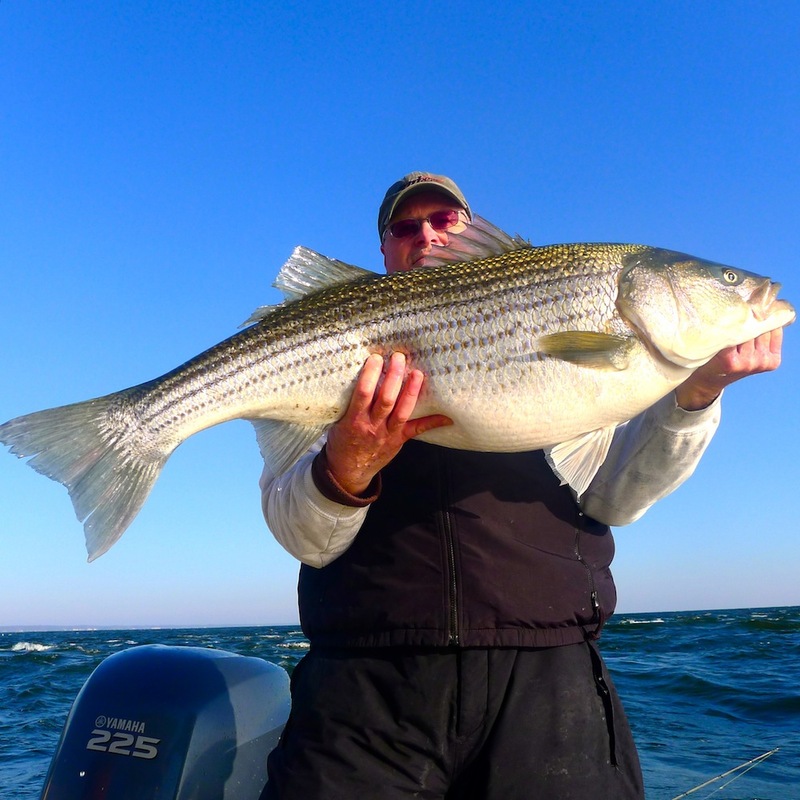 In order for stripers to forage effectively, they have to constantly adapt to the Chesapeake’s changing conditions. The challenge to anglers is to present a lure that is highly visible and attractive to the fish in whatever situation we encounter. Through the science of comparative anatomy (i.e. the investigation and comparison of like characteristics in similar animals) we know that the eyes of a striped bass contain rods and cones that give them the ability to perceive color and distinguish contrasts. We also know that stripers can focus on objects that are either close by, or far away. In order to evaluate how well stripers can see, scientists use a technique called electroretinography (ERG). They put a fish to sleep, then expose their eyes to different colors to determine which ones provoke a nervous system response. They also test something called flicker fusion frequency (FFF). FFF just means the shutter speed of the eye. Just like a camera gathers more light when the shutter stays open longer, fish with slower shutter speeds can see better in the dark. Conversely, fish with higher FFF frequencies see better in bright light. Fish with higher FFF are also better at detecting fast moving objects like baitfish. 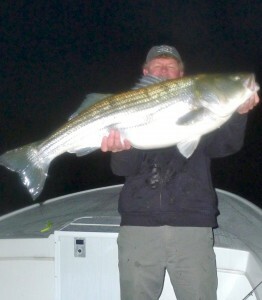 Stripers test out at about 50 cycles per second (Hz). Humans FFF is about 60 Hz. That means stripers see better than we do in the dark, but we humans can see moving things faster than they can. That’s all well and good, but technical jargon aside, what does this mean for fishing? My fishing friends won’t be at all surprised to hear that the colors perceived best by striped bass are – insert dramatic drum roll here – yellow and green. That’s right, science now proves what fishermen have said for generations: If it ain’t chartreuse, it ain’t no use. The studies also found that stripers see a wide range of colors similar to humans, but their color perception is much better during the day. On the other hand, due to migration of their rods and cones toward the back of their eyes in low light, they are better at perceiving contrast in early mornings, late evenings, and at night. 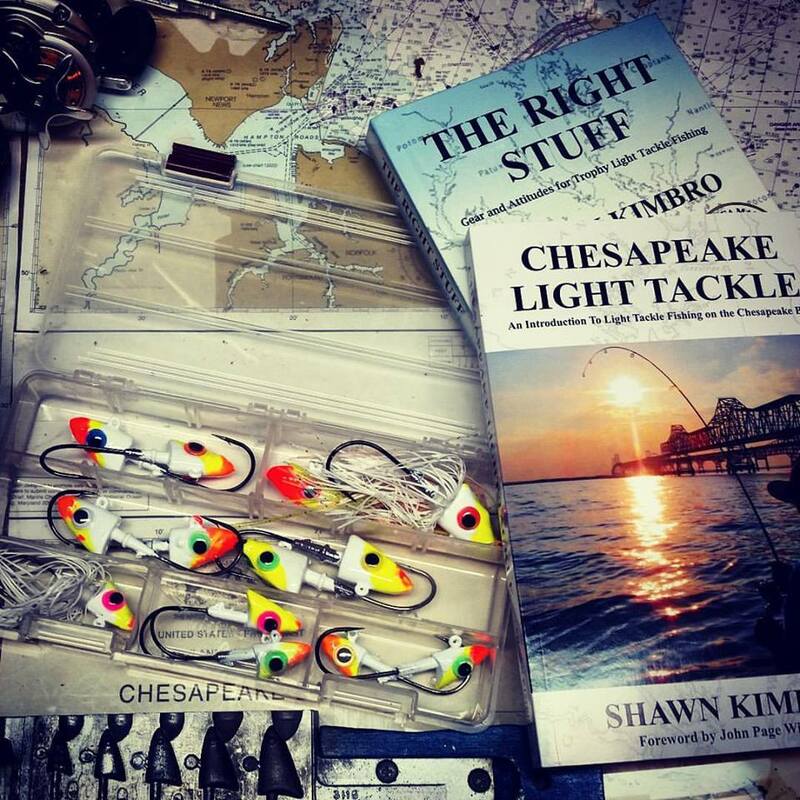 If you’ve read my book Chesapeake Light Tackle – An Introduction to Light Tackle Fishing on the Chesapeake Bay, you know that I strongly encourage the use of big noticeable eyes and contrasting colors on my striper lures. I especially like colors that show up well in the center of the striper’s color spectrum like yellows, oranges, greens, and white. I like to use dark colors at night, and lighter colors during the day. My favorite color combinations are chartreuse and orange, or white and yellow, but I’ll sometimes add blue or red to my lighter colored lures. It’s easy to change the color of a BKD or other soft-plastic lure by using the scented dyes that are now available in almost every bait shop and tackle store in the region. Whether with jigs, top-water plugs, or any other type of lure, I believe contrasting colors can trigger reaction and curiosity strikes from fish even when they aren’t particularly hungry. Since we never know what color a fish might find most attractive at any given time, the use of contrasting colors multiplies the chance that a fish will see and like your lure. Speaking of catching, it’s been pretty good lately. I’m still fishing the warm water discharges with an occasional foray to the Bay Bridge. The fish are looking for a very specific presentation and have only been active in low light situations. The best lures to trigger strikes have been hot-rodded (color contrasting) 10-inch BKDs in darker colors. My fishing partners Rich & Jamie landed and released a 49- and a 47-incher one morning this past week, and I managed a 44- and a few other nice fish early Saturday. I got out early Saturday morning with Rhode Island fishergirl Daphne Forster. As usual, she out-fished all the guys in the boat. 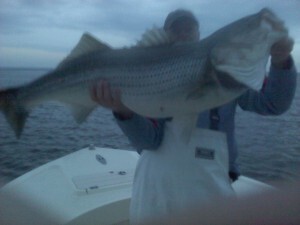 Although it’s been slower than last year, we’ve now caught and released well over two-dozen 40-inch-plus fish in 2012. That’s all the proof I need that strike trigger concepts work. Since the cherry blossoms are in full bloom, I made an exploratory trek to Fletcher’s Boathouse on the Potomac river last Sunday afternoon with my brother-in-law, Mitch. The hickory shad are just starting to show up, and the river is full of big catfish. We couldn’t keep the cats off our shad darts. Trust me, a 30-pound blue cat on 6-pound-test braid and an ultra-light outfit is too much to handle, but we did see a 50-pounder caught by a fisherman with heavier tackle. 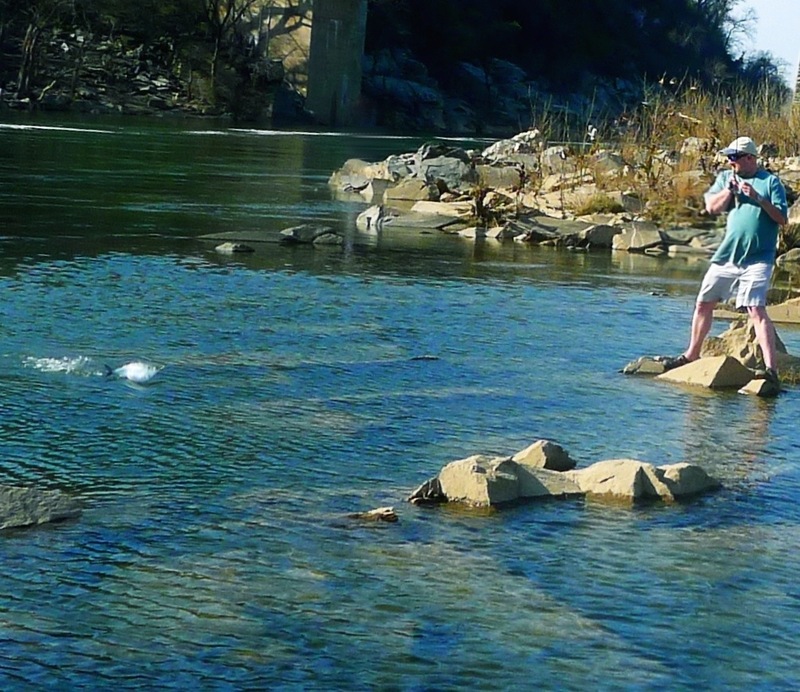 I’ll be making several more trips to Fletcher’s in the next few weeks as more shad move into the Potomac. The river is incredibly clear this spring and it’s a fun place to fish. Water temperatures in the mid-Chesapeake are in the high 40-degree range, and in the mid- to high 50s in the rivers. There are lots of gannets migrating though the middle and upper Bay. Most are just resting on their way north and feeding on what bait we have available. So far, I’ve heard no reports of any bona fide bird shows over hunger-feeding rockfish. That could happen anytime though since the big fish are here to spawn. Not for me, Daphne. I hooked two while shad fishing and had to make the choice of getting broke off or spooled. Lots of very big blue cats in the Potomac right now, but I don’t think I’m motivated enough to gear up for them. I’ve looked forward to another report. I am not disappointed. Those are huge stripers, and that’s a great picture of shad fishing on the Potomac River. I learned a lot from this and I can’t wait for the next installment. Thank you, Emily. Hopefully I can get the next installment in the Strike Triggers series up the first of next week. CC fish have been very specific this year, Chris. With only one reactor running it’s not worth the effort most of the time. Pretty sure I saw Kimbro in the Patapsco last week. Ha! I like the Patapsco this time of year, but I’ve been fishing several warm water discharges on both sides of the Bay Bridge. It’s always hit or miss in the late winter and early spring, no matter where you go. It might be over before it begins if some fish don’t show on the flats soon, Daniel… water temps climbing every day… yesterday found some 63 degree water. I am so glad that my friends south of me are finding some decent fish… for me up at the head of the bay Striper fishing has been dismal… very few fish and we have found them up river where we cannot target them but they have been large fish. Walleye, Largemouth and White Perch have saved the day on more than one occassion with some monster perch being taken… When you release those fish point them north… Please! Do you know at what temperature the DNR closes the fishery on the flats? We had 63 degree temps on the flats yesterday. Catfish have been caught up here on every type of lure we used for Stripers… Once again thanks for posting such great info! Sorry it’s sucked so bad up there so far, Joe. Heard things looked a little better today. Hope it continues to improve. Definitely some nice fish in Maryland right now. Perhaps you should give a paper and demonstration on taking pictures of people holding fish. “Capt” could you be more specific? Yes. I have seen clearer pictures of Bigfoot. I’m with you Capt. Some of them photos are so blurry they remind me of the one’s taken of George Perry’s largemouth bass — about a hundred years ago. Hold the damn camera still Kimbro. Can’t blame Shawn for that one..I sometimes wish I could hold the fish and take my own pic as well.. I think the same thing. You think we can take up a collection to send somebody to photography school? Put me down for $4.00…wait that might buy me a gallon of gas…nevermind I’m out..can’t we just photoshop? I tried to photoshop fix a picture of me with my eyes closed this week, and I came out looking like some kind of redneck alien. Only thing that made me feel better is that you came out worse! But yeah, we better save our gas money. The way these fish are spread out it looks like we’re gonna need it this spring. I also fished the CC discharge on sunday near the end of the flood tide. only a few hits but no hook ups. only saw one other boat. I noticed that there was only about a 3 degree rise in temperature, due to the plant running at partial power? I was disappointed after the run down from Chessy Beach. Still want to fish with you shawn! Hey Jim. CC has been tough this year. Not worth the effort most of the time. Leave a Reply to Jackson O.